eCEMENT is an adhesive resin cement system packaged to simplify the placement of lithium disilicate restorations. 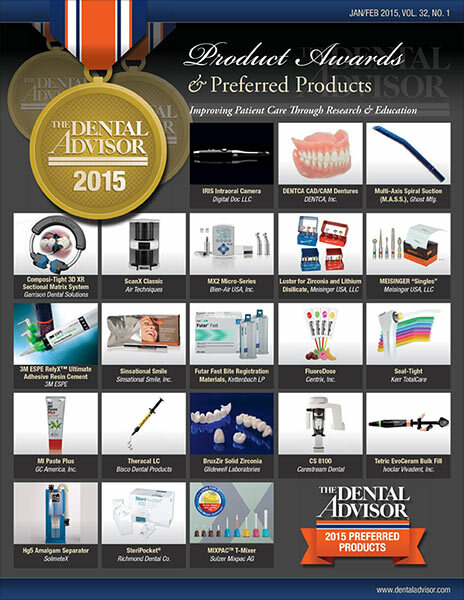 The system includes light-cured and dual-cured versions of eCEMENT plus compatible etchants, adhesives and primers. eCEMENT is radiopaque and can be used to place milled or pressed crowns, veneers, inlays/onlays and bridges. eCEMENT L/C is light cured and is indicated for use with thin, translucent restorations such as veneers or translucent crowns. The light-cured cement is available in three shades (A1, Translucent and Milky Bright) and has a curing time is 40 seconds per surface. eCEMENT D/C is supplied in an automix syringe in a universal shade. Working time for the dual-cured cement is two minutes and the setting time is 3:30. A laminated technique card is included for chairside reference. The eCEMENT kit evaluated containedone 8 g syringe of dual-cured cement, two 4.5 g syringes of light-cured cement in shades Translucent and Milky Bright (an A1 shade is available separately), ALL-BOND UNIVERSAL, Porcelain Primer, Porcelain Etchant, SELECT HV ETCH w/BAC and accessories. 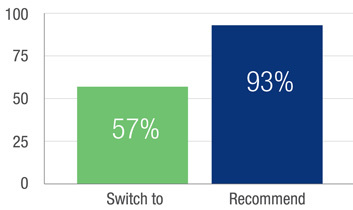 eCEMENT was evaluated by 14 consultants. 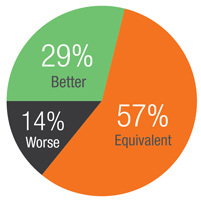 This adhesive resin cement system earned a 93% clinical rating. Complete printed instructions were well written and complemented by a useful chairside technique card. Since the unique feature of the eCEMENT kit is the inclusion of all necessary materials for a cementation procedure, packaging in a sturdy case would be preferred over the cardboard box. One hundred percent of consultants found it useful to have all components for cementing lithium disilicate restorations contained in one kit. Clinical efficiency was enhanced by having compatible materials packaged together. All kit contents were clearly labeled. The viscosity of eCEMENT was flowable enough to allow passive seating of restorations without being overly runny. Complete mixing of the dual-cured cement was provided through the automix tips, and there was plenty of working time. After tack curing for 3-5 seconds, excess cement was easy to remove from margins of the restorations. Clean-up before complete setting is highly recommended. Consultants who took radiographs of restorations cemented with eCEMENT found it to be radiopaque. The shades provided were adequate for the vast majority of cases. The universal shade of the dual-cured cement blended well with teeth and restorations.. Additional shades of light-cured cement plus try-in pastes were desired for esthetic cases. No cement failures were reported during this clinical evaluation. The advantage of having all cementation components packaged in a complete kit was the most highly rated feature of eCEMENT. 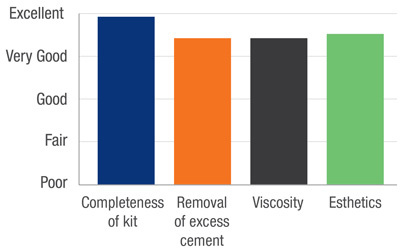 The individual components of the eCEMENT kit all performed well clinically. 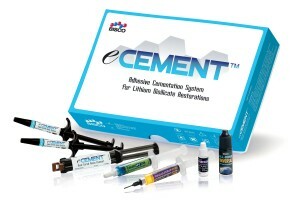 Use eCEMENT L/C light-cured resin cement for restorations less than 2 mm in thickness. Use the total-etch technique when bonding predominantly to enamel. Light curing the dual-cured cement may offer additional strength. eCEMENT may also be used for the cementation of other silica-based glass ceramic restorations.